In reporting to you the advancement of my ship I have the honor to state, that we got our topmasts on end to day—that our lower rigging is rattled down, and catharping’d in. The Hold is nearly stowed.— and I intend our yards shall be across next week. I shall stand in need of my sails from Washington. On March 3, 1813, the United States Congress authorized the construction of six sloops-of-war. Naval architect William Doughty designed three of the six ships and directly supervised the construction of the USS Argus at the Washington, DC shipyards. In Baltimore, Thomas Kemp took Doughty’s designs and began work on the remaining two, the USS Ontario and USS Erie, at his Fell’s Point shipyard. The Erie launched from the shipyard on November 3, 1813 and The Ontario followed on November 28, 1813. Master Commandant Robert T. Spence, commander of the USS Ontario, spent the winter months of 1814 struggling to recruit enough men to set sail—a delay that ultimately kept the Ontario stuck in Baltimore behind the British blockade of the Chesapeake through the end of the war. 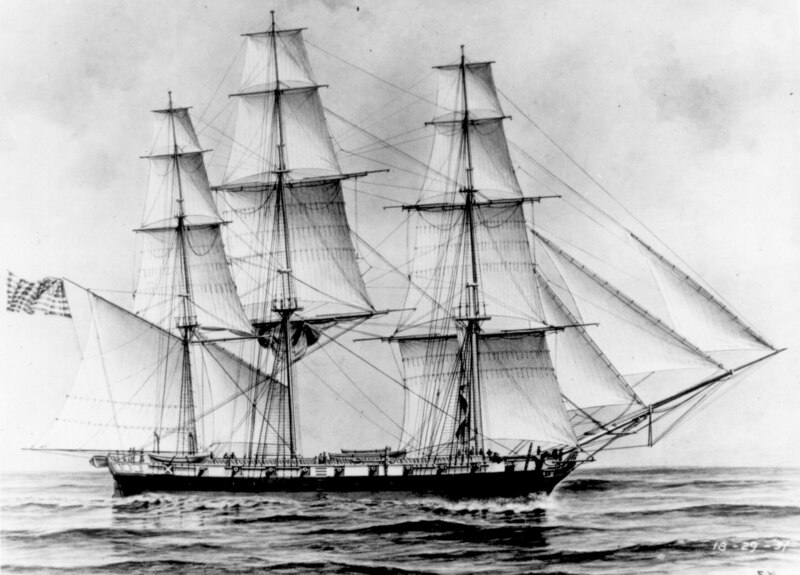 USS Erie, American sloop-of-war. Image courtesy the National Archives and Records Administration, 512994. From the journal of Captain Henry Thompson, January 9, 1814. Courtesy the Friends of Clifton.